Just over a year ago, Lansinoh donated $200,000 worth of pumps to GOOD+, which is a non-profit organization providing services and essentials to families in need. In practice, this donation took the form of over 800 double electric breast pumps, which were distributed to a network of community-based organizations across the US. At the time, Lansinoh issued a statement saying, “we believe all families deserve access to the support and tools they need to meet their breastfeeding goals” and in today’s political climate, this statement is ringing loud and clear in my ears. Mama, if you find yourself struggling, please reach out for help. There are organizations equipped with the tools and support that could make all the difference to your individual breastfeeding journey. 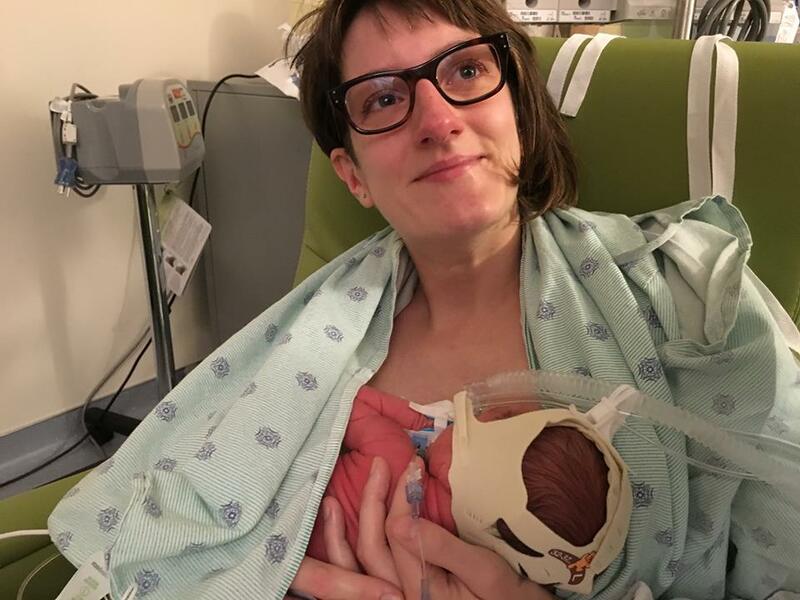 To continue our Pumping Profiles series, this week we're meeting Kate, who used a double electric breast pump to provide milk for her son, who was born at just 35 weeks gestation. Kate's story is a familiar one, because so many moms struggle emotionally with pumping. It is such a huge contradiction to depend on a machine that literally takes baby's place at the breast, in order to maintain and develop a breastfeeding relationship. As you'll find from Kate's story, though, the early struggle pays off. Which pump do/did you use? I was eligible for a double electric pump through my health insurance. I definitely planned to breastfeed. I read up a lot while I was pregnant. I planned to have a natural birth and have my baby placed on me right away and do the “breast crawl” to latch, with everything being magical and natural. But my son was born at 35 weeks and the neonatologists took him straight to NICU. I was wheeled around to see him a couple of hours after delivery and was allowed to briefly hold him later that night, but I couldn’t nurse him because he was on CPAP and had a mask tight on his face. The next day I was allowed to hold him again and he came off the CPAP, but he still wasn’t breathing well enough to nurse. I was pumping for 20 minutes - on both sides - every 3 hours, around the clock. I remember one float nurse left my colostrum in the warmer for a whole morning and I cried so hard. When he was 2 days old I was allowed to try and nurse him. He suckled but his latch wasn’t great and he wasn’t transferring milk. After 8 days in the NICU our son was discharged and although he still wasn’t nursing well directly, I was pumping high volumes by then, which he was getting in a bottle. We were still in the same routine, which is called “triple feeding”: where you nurse, pump, and give the bottle, every 3 hours. By the time he was 8 weeks old he started gaining a pound a week and I had transitioned almost exclusively to direct nursing. Now, he’s 22 months old and we are still nursing day and night. I have occasionally pumped since then, to attend work events (and I took my pump-in-style with me in it’s handy bag!). I also pumped when I got food poisoning last year, as my supply dropped massively, so I pumped for a few days on top of nursing to bring it back up again. Having a preterm baby was a massive hurdle to breastfeeding and is also what led me to pump. Emotionally, I think I resented the pump because it felt to me like these plastic parts were positioned where my baby should have been. Socially, when I took my pump with me to pump outside of my own home, I was offered the bathroom to pump in. I was horrified and actually drove home engorged and leaking milk into my clothes instead of pumping, before nursing my son as soon as I got in the door. I feel comfortable nursing my son in public, but I don’t see many places in which I’d feel comfortable pumping. Pumping is a labor of love. It’s hard work. It’s time consuming. It’s hard to hold your baby while you pump, so it can feel like time stolen from you when you’re a new parent and you just want to hold your baby every second of every day. I know people who are exclusive pumpers for their entire breastfeeding time and I have so much admiration for those mamas! One really practical tip I have is to buy three sets of pump parts. I did this and if I ever forgot to wash one, I always had at least one spare and ready to go. The most exhausting part I found about pumping was focusing on the volume I pumped. It can be very emotionally taxing, so my advice would be to do what you can, and give yourself a break! If you're a pregnant or nursing mom and unsure as to whether your pump is covered by your health insurance, go ahead and click here to find out. The form doesn't take long to complete and most moms will find that a double electric pump, such as Lansinoh's Signature Pro, is fully covered.